We were there doing a St George’s event with a number of other groups including the wonderful Atkinson’s Action Horses who we have seen before a couple of year’s ago doing their dressage display at Bolsover. 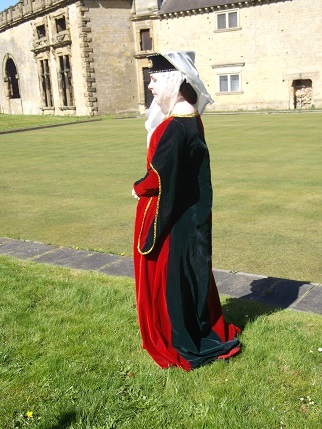 William Cavendish who built the castle was a very keen horseman and the riding stables have been restored and are used for a display of 17th century horsemanship by the group. This weekend the group were displaying combat training and stunt riding and there were some brilliant flips and rides alongside the horse either horizontal or vertical while still holding on and the incredible riding of two horses at once. They do stunt work for lots of TV shows and films and we saw the horse that has been used in Poldark which was very exciting! Go and have a look at their web site to see pictures of the stunts. As well as all that there was us with the usual weapons and armour talks, head dress talks and combat , this time with a difference as it was with dragons! Sadly not Game of Thones standards but two of our members Jamie and Trevor did a brilliant job dressing in dragon costumes to thrill the crowd. 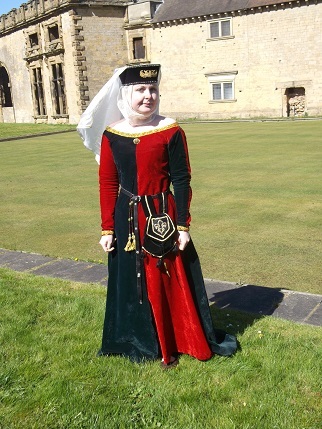 It was also an outing for the new costume we have been working on. I can’t take credit for Jamie’s new outfit apart from the material which I gave him as the gown was made by Jackie from Cloaked and Daggered and he looks very lovely in it. Here he is on the left of this picture with Luke. 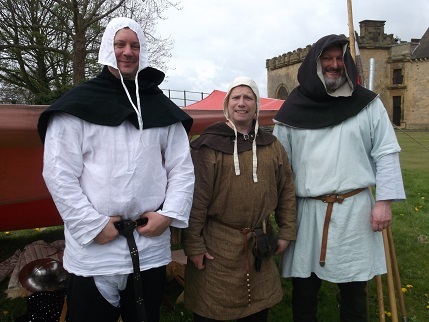 And here are James, Trevor and Richard – looking not quite so fine and dandy but very happy in their peasants’ outfits. Ellie I can take some credit for, she has had this gown and coat for a number of years, we bought it from a friend who had it made by the genius that is Kat from Kats Hats. 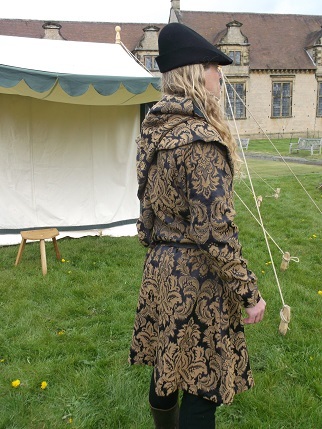 Ellie had outgrown the gown so I altered it, removing two of the coat panels to make new sleeves. I am planning to make a matching torque head dress similar to the black one that she is wearing in the picture which was one of my earliest makes. 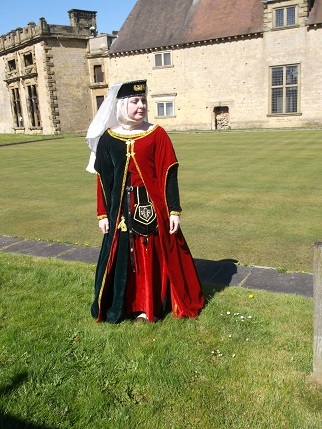 She had many compliments on the outfit and had her picture taken with lots of children who wanted to be with the ‘princess’! 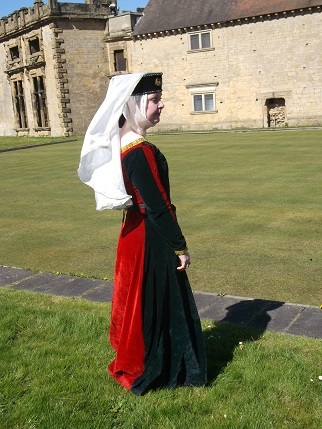 It is lovely to wear being made of silk velvet which is a very fine material and looks beautiful on her. So back to reality this week with the start of teaching term and a few weekends at home to make more kit! Take care and thanks as always for visiting. Yes, it’s a fine looking costume, and I can imagine loads of little girls with eyes like saucers….! Jelly! I want to come camp at a UK event. That looks like so much fun. Oh it is fantastic fun – we are so lucky to be able to camp in fantastic places. 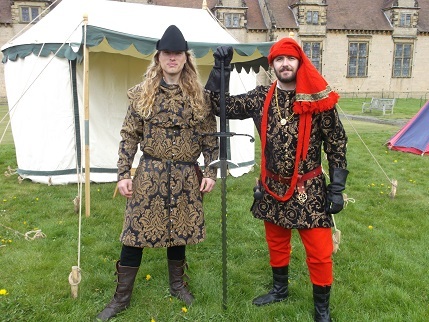 Next event is at Ashby de la Zouche Castle at the end of the month- one of my favourite events.